STS Technical Services is hiring Test Technicians at Aberdeen Proving Ground in Maryland. In this role, you will work to test brand new military vehicles and support engineers testing vehicles and parts/components. This role may also provide support in the fabrication and assembly of vehicles and related systems/sub-systems. The objective is to validate new product designs as part of new product development as well as resolve issues on sustaining products. This is a tremendous opportunity to work for a company that holds industry leading standards for defense and also is on the leading edge of an industry boom. 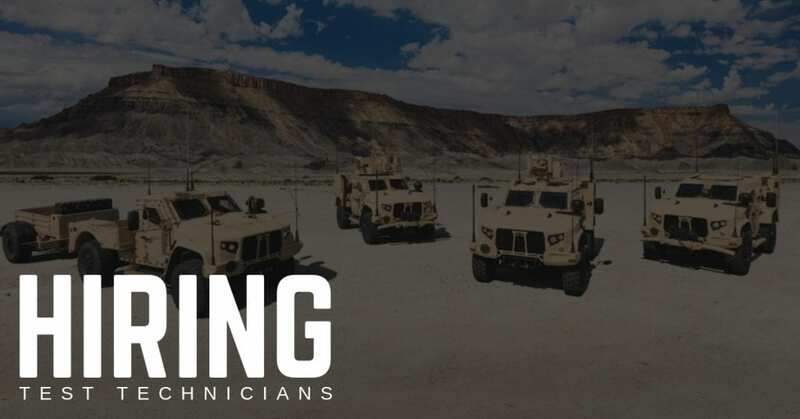 This contract would offer you the opportunity to work on the Military’s most advanced heavy wheeled vehicle – the JLTV. Conduct testing of prototypes and current products to determine capabilities of vehicles/systems and conformance to specifications and/or regulations in partnership with engineers and senior level technicians. Test and record data using operational knowledge of vehicle systems (electrical pneumatic, hydraulic) using manual entry and data acquisition. Troubleshoot systems, perform basic failure analysis and follow detailed test procedures. Assemble, disassemble, and fabricate complex/customized parts, mechanical structures and test stands/fixtures in partnership with engineers and senior level technicians. Maintain a safe work environment; adhere to all safety procedures during all aspects of job performance which includes regular exposure to personal and physical hazards. Operate heavy equipment/machinery or drive vehicles as required for the purposes of testing or material handling. Determine appropriate test instruments for product testing. Plan and schedule daily activities to complete assignments in their order of priority to make effective use of time and ensure projects are being completed within identified timeline. Communicate effectively and work cross functionally to resolve technical problems including the ability to provide constructive feedback to all levels of the organization. Interpret and execute written/verbal directions and instructions. STS Technical Services places Mechanics, Engineers, veterans and technical professionals into contract and direct hire positions across the U.S. We work with some of the largest corporate names in the country, and we have hundreds of opportunities for you to explore! If you have questions, please call 1-800-359-4787. Otherwise, all interested applicants are encouraged to apply directly on this page.